Currently Dmitry Bertman is working at a production of Offenbach's La belle Hélène operetta, the premiere is scheduled for October 3-5 and 8-11 in Helikon-opera, Moscow. The production La Belle Helene was on stage of the Stanislavsky and Nemirovich-Danchenko Moscow Music Theater for thirty years before and long after I was born. I still have the most warm and tender memories about this production. 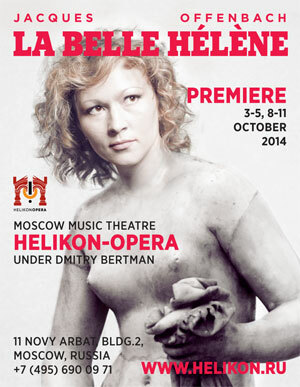 Now Hélène is not in the repertoire of an any Moscow theatre. Our version is the authors's edition, which is a rare thing in modern staging, as since its creation the Offenbach's music went through a number of different orchestra versions. Operetta is under the pressure of opera and musical from both sides, that is why I have decided to giveLa belle Hélène the shelter at our temporary home in the Arbat Street. Frankly speaking, I do hope very much that with this production we would farewell this stage and our next premiere would happen in our sweet home in the Bolshaya Nikitskaya Street.